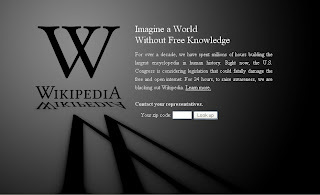 Log on to Wikipedia.com today, and this is what you get. This is one of the ongoing strikes on the web today, Jan 18th, as a show of opposition to the Stop Online Piracy Act (SOPA) that is undergoing consideration in the US Congress now. I didn't actually have any idea on what SOPA is all about. My interest was piqued by how some of the biggest websites (e.g, Facebook, Google, Wikipedia, and Wordpress) are all against it. What could possibly be wrong with the bill? After reading a few articles about it, I had an inkling that this bill, once acted upon on January 24th, will have a huge impact to freedom of expression. I have yet to fully grasp the intensity and extent of constraint that SOPA would have on Internet denizens, but any act that inclines to restraint of freedom is sure worth taking a good look at.